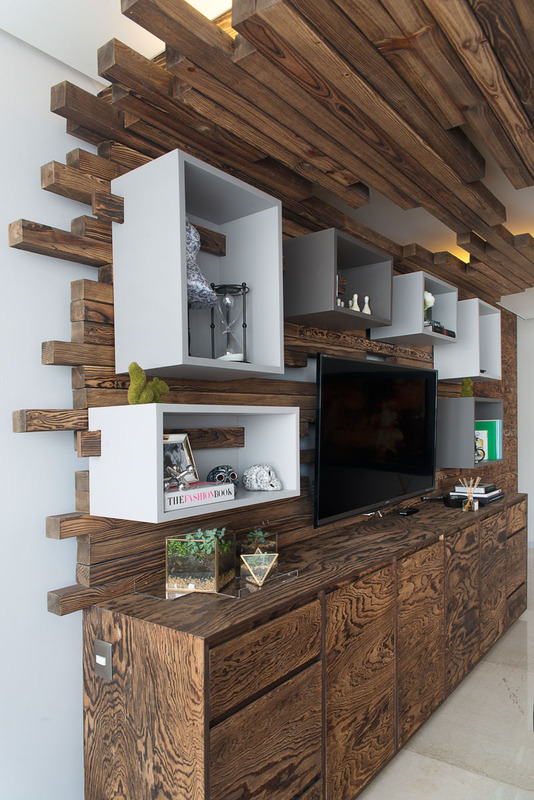 Wooden ceiling is taken to the next level for this apartment. Every home comes with a different design depending on what the homeowners want for it and also what they would agree with the designers. Sometimes, there are very unique and even weird ideas for an interior but when this is done, the result is stunning and will even make the house standout from other homes in the area. 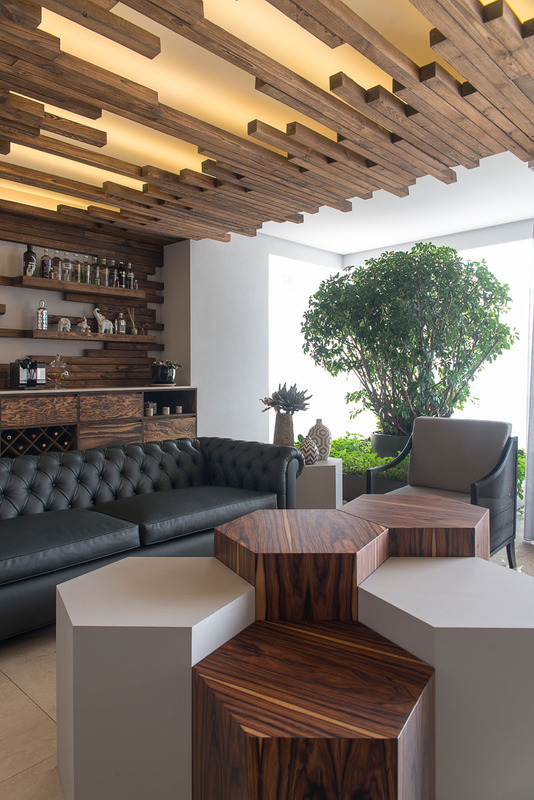 When we talk about ceiling design, there are so many ways to do that and one is just by using wood and adding intricate wooden details to it. We have seen some homes with ceilings like that and today we are going to show you one space with an impressive ceiling design. Apartment KG in Mexico City has a floor area of 400 square meters. It made use of neutral colors with earth tones accented with different colored buds on accessories which complements with the overall design of the space. The interior has a unified design ceiling which made way reclaimed wood lattice contains throughout its hollows the luminaries which indirectly illuminates these spaces. These areas of coexistence are complemented by the dining room which is subtly separated from the kitchen by a breakfast area that is closed to the dining room and opens onto the kitchen area. The central landmark of the public part of the space is the library that is accented by a sober completely finished in gray marble fireplace. All bedrooms are grouped in a wing wherein the master bedroom is complemented with a television. Unique feature: This apartment features impressive wooden details on the ceiling which is a unique element in the interior. 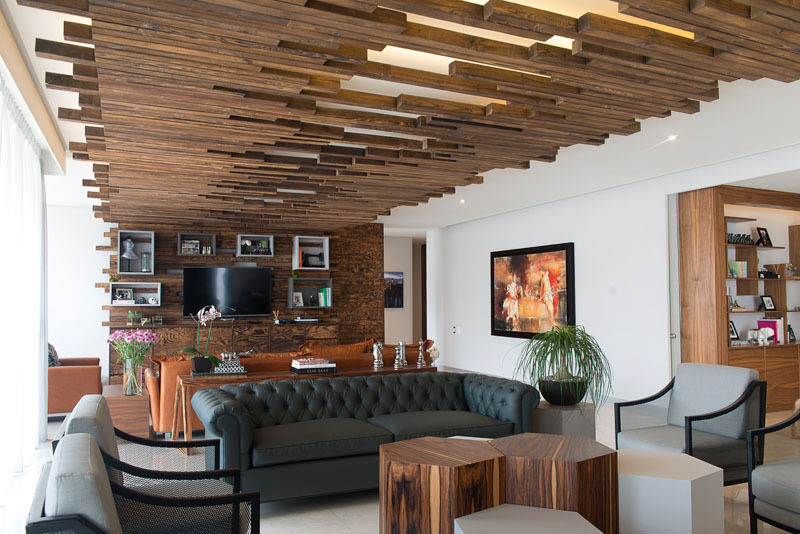 Don’t you love the idea of using wood for the ceiling? I like it that the light just peeps from the wood in the ceiling. I could tell that it would look really nice during the night. You can see here that aside from the living area, it also has another seating area where one can watch the television. The interior of the house apartment looks really gorgeous. Apart from the wooden ceiling details, you can see that it also use lovely furniture in it which adds beauty to the area. At one end of the living room is wall with a television, cabinetry and box shelving. You can see that in this area, the details of the ceiling is also used in it. 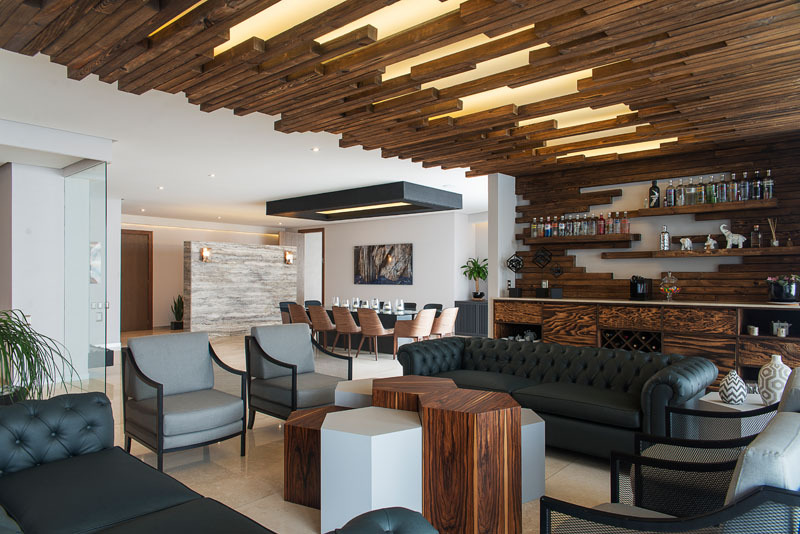 While at the other end of the living room, one will see is a lounge and bar that has floating shelves above the bar that blend into the ceiling details, creating a unified and seamless look. I like those hexagonal tables in the center. The formal dining area of the house is seen here which allows 12 people to sit on it. It also has a glass table top for the long dining table which looks great with the wooden dining chairs around it. Above the dining set is a black frame where the light is contained. On the part of the house where a working area and a mini-library are located, you will be able to see a fireplace on the other side. 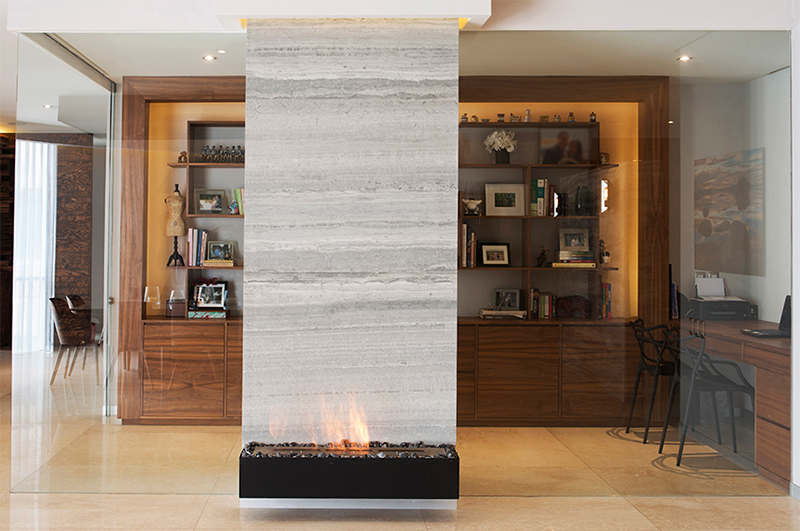 This modern fireplace looks really beautiful and it doesn’t just bring warmth to the area but also beauty and aesthetics. 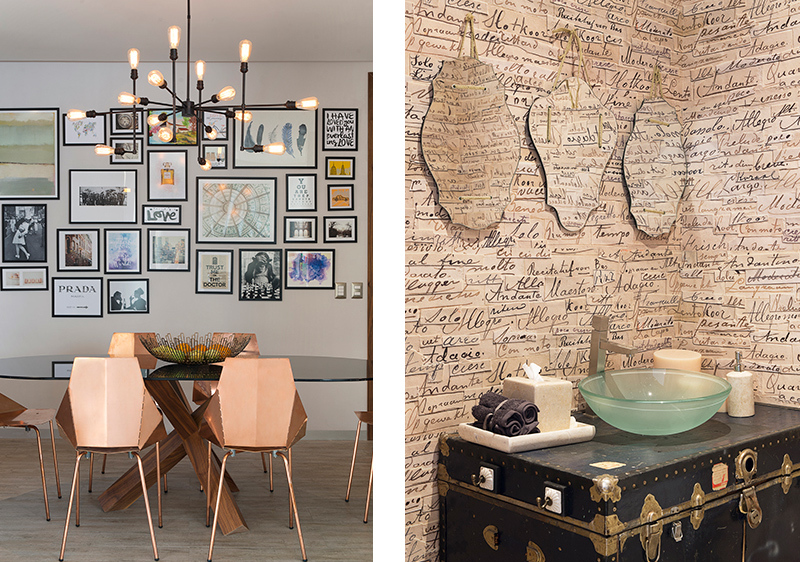 The dining space has a gallery as a backdrop with an industrial pendant light above it. On the other side of the picture is the bathroom with a vintage design. It has a wallpaper that looks busy with the handwritten design and it also used an old chest for the vanity which I think if very creative! 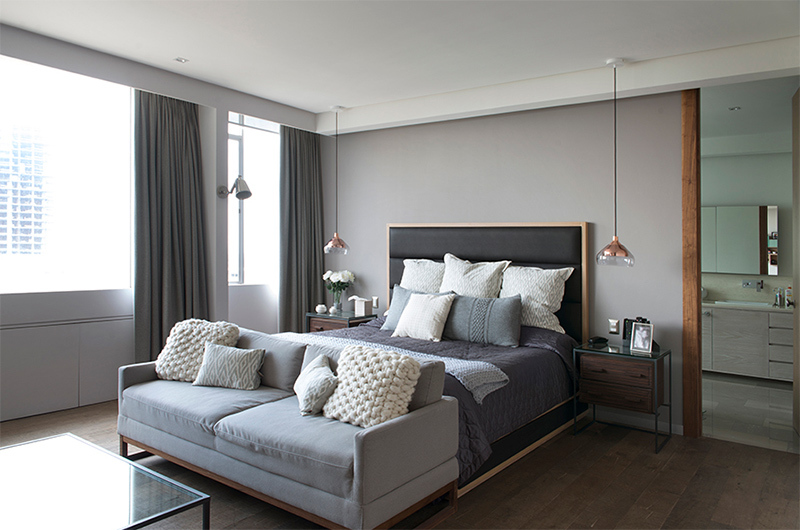 This is the bedroom of the house which has gray colors in it from the walls to the bed covers. Notice the lights at both sides of the bed as well as the different kinds of fabrics used in it. 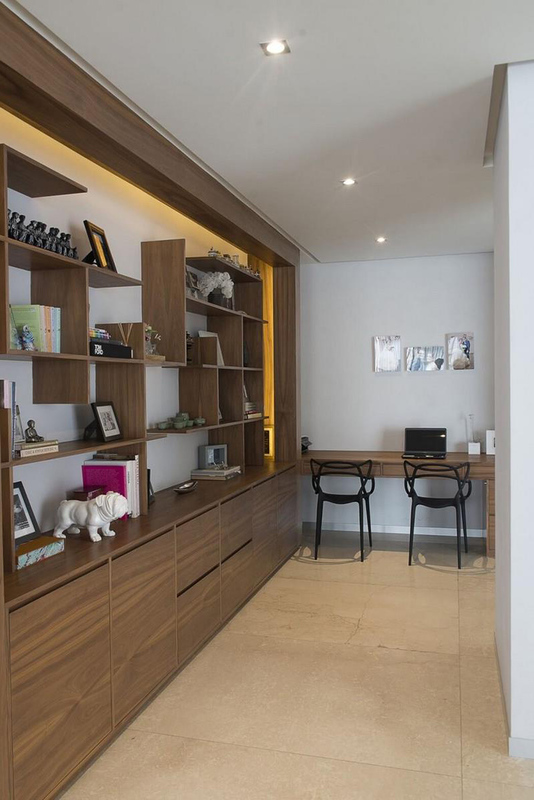 The house also has a small office or working area wherein you can see a tall shelf that has various displays and decors on it. Aside from that, it also has drawers and cabinets below it for storage. I can tell that this is indeed a nice place to work in. 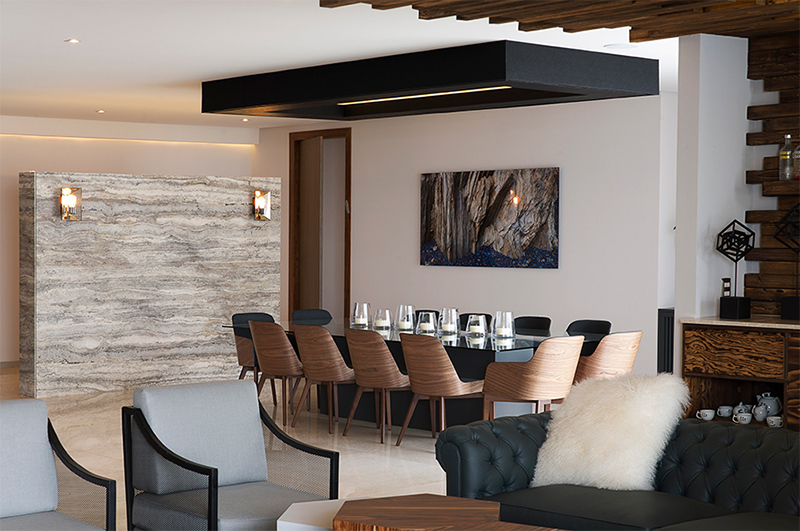 Kababie Arquitectos decided to define the living area of this apartment by installing decorative wood feature in it. The ceiling details wrap the space from one end of the room to the other and down the wall on the other end. The result is really nice and beautiful and made it a unique feature in the house. Aside from the ceiling, the neutral colors used in the interior are also gorgeous creating a warm and cozy apartment interior. I also like the decorations in the house as well especially those that surround the television. But I’m not a fan of the wood texture they used here. Maybe if it was lighter, I would give this a go. How about you?